1. You will get 5% back on your aggregate weekly net loss from your weekly betting activity. The weekly period is from a Monday 00:00 to Sunday 23:59 with money back bonuses being credited before 6PM every Tuesday. 2. The aggregate net loss is calculated as: Winning bets profit - losing stakes. For example, you have winning bets for R5000 (stake excluded) and losing bets for R6000. The net loss for the week is R1000. You will get 5% back on R1000 which is R50. The minimum net loss for the period taken must be R100 or more to qualify. 3. Maximum money back amount is R1000 per week. 4. To receive money back, your bonus balance on your account must be on R0. If you have an active bonus then you will not qualify for a new bonus. You will also only qualify if you have made a real money deposit within the past 14 days of the qualifying Tuesday. For example, if you qualify for a bonus on Tuesday 18 September 2018, you must have made a deposit within the period 3-17 September 2018 to receive your money back bonus. 5. 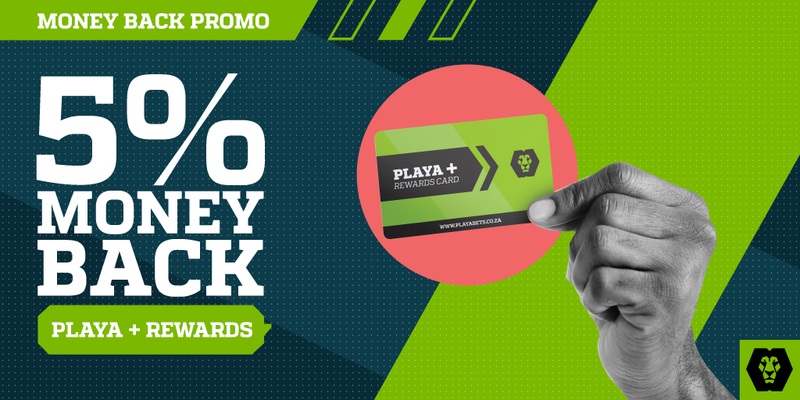 Once you have qualified for the money back bonus, claim your funds by accepting the bonus in your Playa Bets account notifications once you have been contacted by email or sms. 6. Bets taken with BONUS money do not qualify for this promotion. 7. Withdrawal Terms and Conditions apply. If you make a withdrawal, any existing bonus balance in your bonus account will be forfeited and your bonus balance will go to 0.